Just the words, “old-fashioned soda,” brings back childhood memories of times spent with my grandparents. I remember the first time my Pawsie (my grandpa) MADE root beer for me. I was amazed by his magic of creating one of my favorite drinks from a small bottle. Yes, I know now it was just root beer extract, but for a kid, he was my soda magician! I loved his homemade root beer enjoyed in my Roy Rogers mug. The only way I loved it more was with two scoops of vanilla ice cream as a float. 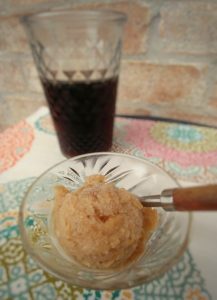 I liked to stir and stir the ice cream around until nice and creamy like soft serve root beer. Ice cream sodas and ice cream floats almost seem like part of a bygone era like their counterparts, the drugstore soda fountain shops. I loved going to the soda shop with my grandparents and climbing onto the swivel stool, often with a little help from my Pawsie. I felt so tall sitting at that counter. My order was always either a nectar soda or a root beer float, my two soda shop favorites in the fancy glasses with extra long straws–perfect for sword fights with my brother. Years ago, I found a soda shop in a small town and feeling nostalgic I just had to go in and order a root beer float. I took my first sip and tears came to my eyes. The root beer magic was back and I was transported to my step stool in my grandparents kitchen watching my Pawsie scoop vanilla ice cream into my Roy Rogers mug. They say tastes and smells evoke strong memories and I cherished that delicious fragrant flashback. I no longer drink sodas but I had root beer that I bought for company. I knew I couldn’t throw it away. I thought I’d use it to make a roast or spare ribs, but never got around to it. So, I thought I’d treat myself to a root beer float, but the root beer was too flat. 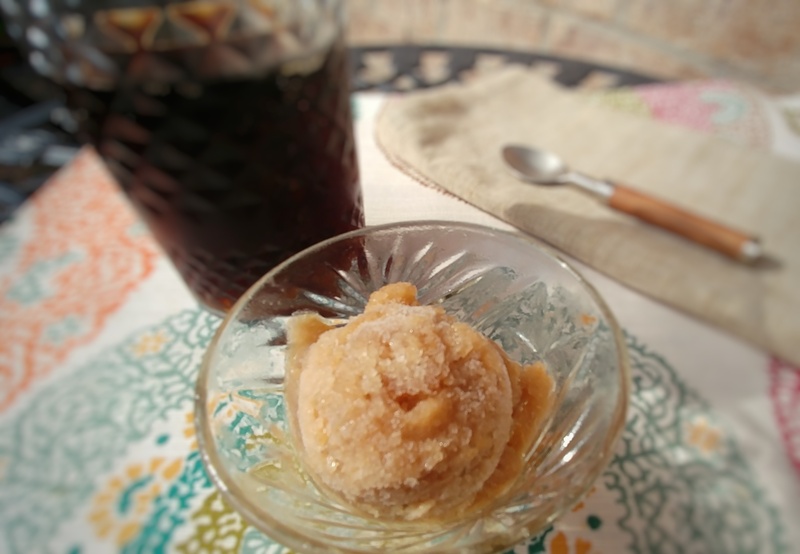 As I remembered the creamy floats of my past, I also remembered old-fashioned creamy soda sorbets. No ice cream, no milk, no cream but one very important secret ingredient: Marshmallows!! Don’t worry if you are like my hubby and loved brown (or black) cows, root beer floats with chocolate ice cream, just use chocolate marshmallows. Keep this recipe handy for any soda-flat or not. Place marshmallows in a saucepan. Spoon 1 Tablespoon soda over marshmallows and heat slowly over low heat. Using a rubber spatula, fold marshmallows over and over until almost melted. Remove from heat. Continue folding until smooth and fluffy. Let cool for 1 minute. Add remaining soda, salt, and lemon juice. Blend thoroughly. Pour mixture into a shallow tray. Cover and freeze until firm stirring twice the first hour. Put on Your TO COOK IS TO CREATE Thinking Cap: Think of all the different flavors of marshmallows and sodas. Create your own old-fashioned soda fountain sorbet shop with different flavor combinations. I want to try caramel marshmallows. I’m also thinking of strawberry marshmallows with cream soda might come close to my nectar soda. What are you favorite childhood soda fountain treats? See if you can recreate it into an old-fashioned sorbet. If you have any leftover marshmallows make Marshmallow Surprise Muffins. FOOD FUN: According to Wikipedia, “In Australia and New Zealand, an ice cream float is known as a “spider” because once the carbonation hits the ice cream it forms a spider web-like reaction.” Somehow, I cannot imagine saying, “I would like a “spider” please! !